Something Very Important to Consider: We are USA Based Seller + Speedy Delivery + Great Customer Service = Great Product at Great Price. Fix cracked lens, non-working touch function on your iPad Air. This product will only be compatible with the 1st Generation iPad Air. 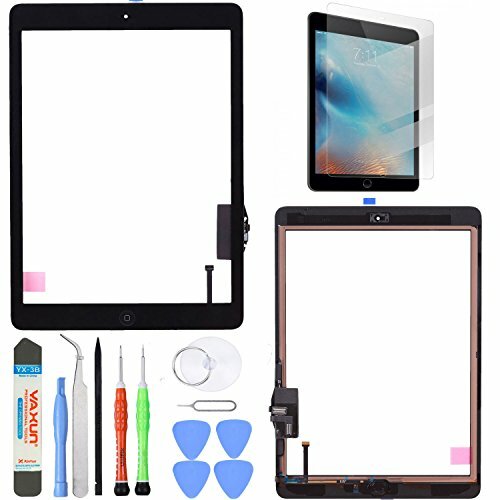 Front Glass Touch Screen, Digitizer, Home Button, Flex Cable and Adhesive Tape pre-installed for easy installation. Buy today and save money by doing a DIY repair. Attention: If any damage occurs during installation we cannot be responsible for it. We always recommend the use of a trained technician. However DIYS (do it yourself) installers/repairs are always welcome and we will gladly assist you in any way we can. If you have any issues feel free to contact us via email. All parts are tested and quality controlled prior to shipment. If you have any questions about this product by Unifix, contact us by completing and submitting the form below. If you are looking for a specif part number, please include it with your message.